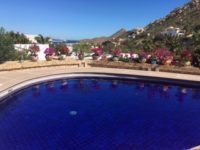 Enjoy a relaxing 6 night stay in this charming 1600 square foot villa overlooking Pedregal Bay, in an upscale resort area of Cabo San Lucas. Within walking distance to downtown Cabo, Villa Mira Flores can host 4 adults in 2 spacious bedrooms with king beds. Splash in the private pool while watching cruise ships sail slowly into port. Cook your own gourmet meals in the remodeled, fully appointed kitchen. Additionally you will enjoy a $100 toward a stunning meal at Misiones De Kino Restaurant in downtown Cabo.